After Mark Olson departed The Jayhawks in the mid-nineties to persue even more roots based music via a solo career and with his band Harmony Ridge Creek Dippers, his co-founder Gary Louris took charge of the band. ‘Sound of Lies’, ‘Smile’ and ‘Rainy Day Music’ were fine albums, with Louris expanding the band’s country rock repertoire to include elements of classic pop music. Lots of the Americana roots remained, of course, but without Olson, something was very different. 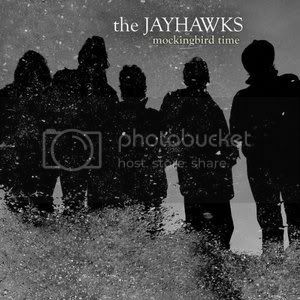 ‘Mockingbird Time’ – The Jayhawks’ eighth studio album – marks the end of an eight year recording hiatus and return of Mark Olson. It is the first Jayhawks release to feature both founding members in fifteen years. Within a few bars of the opening number ‘Hide Your Colors’, the listener is transported back to The Jayhawks at their peak, and those timeless, rootsy songs which filled the grooves of their 1994 masterpiece, ‘Hollywood Town Hall’. The vocals may be slightly more weathered than on the early Jayhawks releases, but Olson and Louris sound simply marvellous together, with Olson’s slightly worn folksy tones underpinning Louris’s easily recognisable higher registers. On the more country side of things, ‘Guilder Annie’ is a superb number, rootsy but never syrupy. It’s a number full of great harmonies, which once set against an almost waltzing arrangement augmented by a subtle steel guitar, becomes essential Jayhawks. Also very commendable, ‘Black Eyed Susan’ showcases the acoustic side of the band; while the acoustic vibes are great – and a moody fiddle accompaniment works well – it’s the dual vocals of Olson and Louris which really pull in the listener. Strong, yet never perfect, their very natural style gives the sense of something recorded in one take. As the track pulls to a close, the fiddle takes centre stage, playing in a more upbeat style. Since the music never really breaks from its original mid-paced arrangement, this gives a much needed climax. The title cut has a sense of fragility, beginning with a slightly jarring vocal complimenting a simple piano line from Karen Grotberg. At first, it’s a song which appears unsure of itself, but soon, the drums find a place and a steady bass line pulls everything together. By the time you’ve tuned into Olson’s vocal midway, the track really starts to build. Occasionally the use of accordion can be a little distracting, but the other elements are wonderful. From some rather more passionate vocals, a brief guitar break and Grotberg’s piano – which has a presence throughout – everything is wonderful. By the close of the number the piano finally finds the courage to add a few lead notes to the mix. This track may not grab you at first, but after a few spins, the warmth of the arrangement and romanticism within the lyrics will have won you over. If it doesn’t click with you after a while, let’s just assume you have no soul. Slightly edgier, Cinammon Love’ brings in a Neil Young style reverbed guitar, over which Olson and Louris lay a dual vocal. On occasion, the lead is placed against a selection of backing voices which appear to be working against the harmony. The spikier parts of the arrangement are given the perfect counterpart in a chorus which focuses a on much tighter vocal harmony, acoustic guitar and piano. There’s just the right balance between the smoother moments and the slightly rockier elements. ‘Stand Out In The Rain’ adds an occasional steel guitar to the band’s country rock sound, but due to a slightly louder approach to the guitar on the chorus, things do not ever feel too country. The guitar is in a similar style to parts of ‘Cinammon Love’, but once again, this never seems intrusive. While the arrangement is top notch, in terms of song writing, this number is potentially ‘Mockingbird Time’s weakest, due to constant repetition. Still, everyone’s allowed a creative blip! Elsewhere, ‘High Water Blues’ provides a strong acoustic stomp, lavish with harmonies and ‘Pouring Rain at Dawn’ is simply gorgeous. On the latter, the band offer something incredibly understated; twin harmony vocals – with Louris taking the lead – sit well against a shuffling country number with brushed drums and warm bass. Perhaps the best number of all, however, is ‘Tiny Arrows’, a moody piece which captures both Olson and Louris in their finest voices this time out. Louris’s higher pitch is given the perfect accompaniment by Orson’s soft melodies, but no matter how great their voices are, it’s the epicness of the music which will have you coming back time and again. Over a brooding soundscape, the steel guitars cry softly against the acoustic rhythms and the piano has a sense of leading without dominance. Think of a softer, slightly spacier take of Neil Young’s ‘Cortez The Killer’ and you’ll have about half an idea what this sounds like. Honestly, this could be one of the finest numbers the band has ever recorded. Fans of The Jayhawks will undoubtedly welcome their return, and rightly so, since ‘Mockingbird Time’ is remarkably consistent. After a few listens, these songs will feel almost as familiar as those songs the band recorded nearly two decades previously, proving The Jayhawks are still among alt-country’s finest, no matter how long between releases.